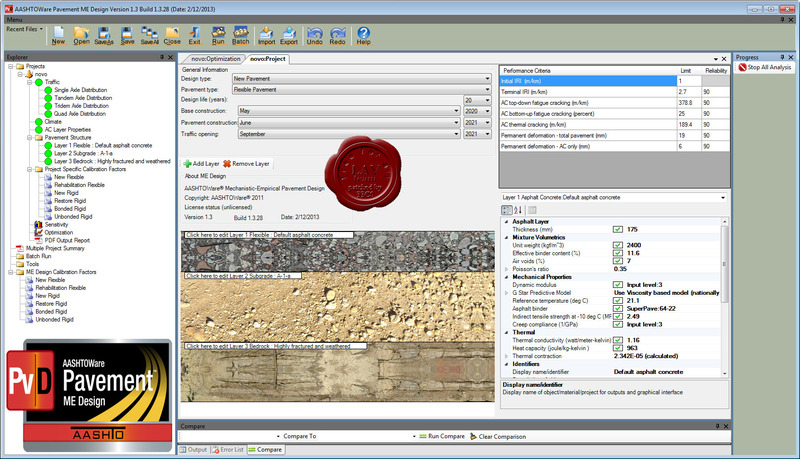 AASHTOWare Pavement ME Design is a pavement design software, which builds upon the mechanistic-empirical pavement design guide, and expands and improves the features in the accompanying prototype computational software. ME Design supports AASHTO"s Mechanistic-Empirical Pavement Design Guide, Interim Edition: A Manual of Practice. ME Design is a production-ready software tool to support the day-to-day pavement design functions of public and private pavement engineers. The Pavement ME Deflection Data Analysis and Backcalculation Tools is a standalone software program that can be used to generate backcalculation inputs to the AASHTO Pavement ME Design software for rehabilitation design. The tool is capable of analyzing raw deflection data files obtained from Falling Weight Deflectometer (FWD) testing devices, backcalculating in-place elastic layer moduli for flexible and rigid pavements and generating inputs for performing rehabilitation design using Pavement ME. It can also be used to perform loss of support analysis and load transfer efficiency (LTE) calculations.